Prison camps in Gash Setite. Some prisioners were also lost their life in these prisons which are listed below. These prisons are located at Adolay´s prison camps in Gash Setite. Dembe-Gedamu, February 11, 2001-March 2001. Lese (Mont-mer´awi), December 27, 2001- may be November or December 2003. 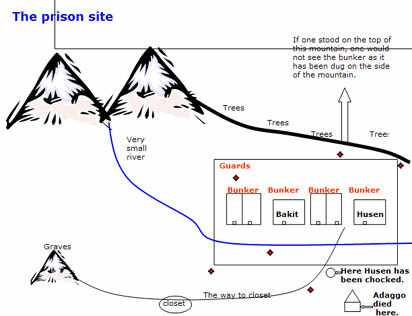 The first four prison camps are located near the “GAMALO” mountain. The 5th one, which is called “LESE” is located near the town of “Addi-Hagerai”. The prison-cell is very narrow and there was no opening letting the air through.